Windows Undelete File Recovery Software. Download now. Recover My Files is do it yourself file recovery software to undelete files emptied from the Windows Recycle Bin or undelete files from a formatted or corrupt hard disk, smart media, compact flash, USB drive or other storage media. Download now to Undelete and see the File Recovery results! Download and try Recover My Files Free! How is it possible to Undelete Files? When a file is deleted on a Windows computer the contents of the file is not destroyed. Windows maintains a list of all files stored on a Windows computer in a table known as the "Master File Table" (MFT). When a file is deleted and emptied from the Windows Recycle Bin a special deleted file marker is placed next to the file name in the MFT. Recover My Files scans the MFT to locate the deleted file markers and makes it possible to then undelete and recover them. In some situations the MFT can become corrupt or damaged so that file recovery is not possible using the MFT undelete method. In this case, Recover My Files scans the entire drive to locate individual files by their structure (unique header and footer) and content. How is it possible to Undelete an entire Windows drive? When a hard drive or other storage device is formatted, corrupt, or RAW, it means that the Windows Operating System in no longer able to read the drive setup information. This includes partition information (drive letters, e.g. C:\) but can also the "Master File Table" (MFT) which is a list of files telling Windows where each file is located on the disk. As disk recovery software Recover My Files uses a number of techniques to maximize hard drive data recovery. Firstly it quickly scans and reconstructs Windows drive letters to undelete files; if no drive letters are found it will then searches for and reconstruct MFT tables; if not MFT tables are found it searches for and rebuilds individual file MFT records. Should I try Recover My Files? Recover My Files is designed to enable home users to undelete files without having to send their media away to expensive data recovery services. Recover My Files data recovery software will not change the contents of the drive being searched in any way. It is risk free undelete software that will allow users to see exactly what files can be recovered by previewing the contents of documents and graphics. 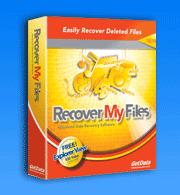 Recover My Files software is simple to use with no technical recovery skills required. It will undeleted files from all types of media, including hard drive, USB drive, floppy disk, smart media, compact flash media or other removable media. Download and try it now to Recover Deleted Files.